Boil 2 cups of water with Salt, Black Pepper, Dill, and Cayenne for flavor. After 10-15 minutes (or when all of the water is absorbed) remove Quinoa and set aside in a large bowl to cool off. While that is cooking, prepare your shred the Carrot and chop the Red Bell Pepper, Onion and Beets. Keep the Beets in a separate bowl or everything will turn red! To make the dressing, combine the Olive Oil, Rice Wine Vinegar, Bragg's, Mustard, Honey and Ginger juice. Lightly mix using a small whisk or fork making sure to loosen the Honey so it does not remain in a lump. 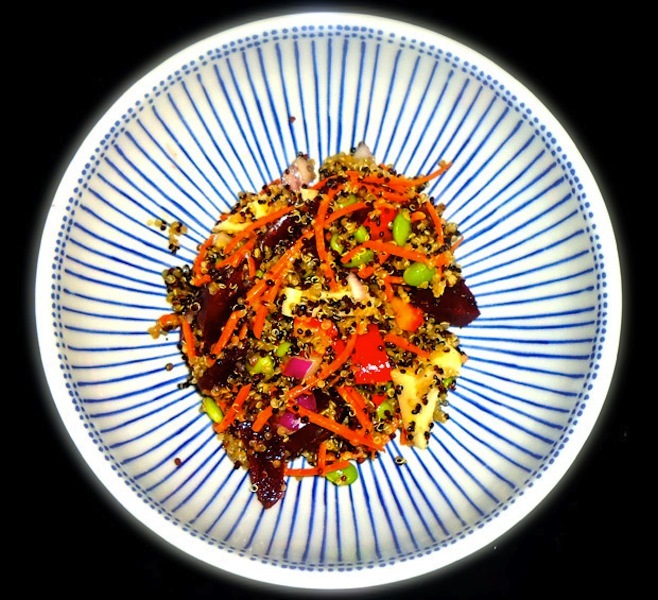 When the Quinoa has cooled off, mix in all of Vegetables (with the exception of the Beets) and toss with the Honey Ginger Dressing. Let this cool in the refrigerator for one hour. When you are ready to serve, carefully add the Beets and crack some Black Pepper on top.